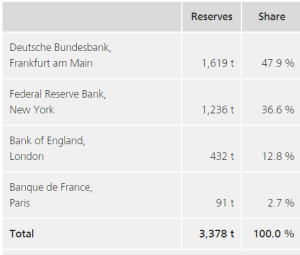 Deutsche Bundesbank holds the second largest central bank monetary gold reserves in the world and values these gold reserves at market prices on its balance sheet where they constitute over 60% of the central bank’s official foreign reserves. 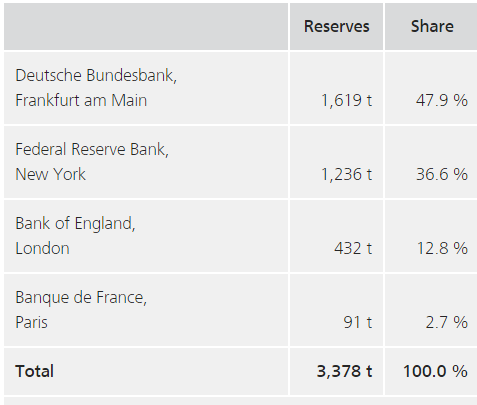 These gold reserves are owned by the German State and are merely held and managed by the Bundesbank. The Bundesbank has the dubious distinction of initiating a gold repatriation program that has been widely ridiculed for its excessive length, and that has pressurised other central banks to follow suit. Deutsche Bundesbank was only able to repatriate an embarrassing small 5 tonnes of gold from New York in 2013 and this even had to be melted down and recast. Of the Bundesbank’s 85 tonnes of gold repatriated from New York in 2014, 50 tonnes of that gold also needed re-smelting. The Bundesbank is extremely secretive and non-cooperative in sharing with the public any real information about its gold holdings such as industry standard gold bar weight lists. The German Federal Court of Auditors has been highly critical of the irresponsible way in which the Bundesbank historically never audited the German State’s gold reserves held abroad. Germany’s central bank, the Deutsche Bundesbank (German Federal Bank), holds the world’s second largest official gold reserves, with claimed holdings of 3381 tonnes, stored over four locations. Of all central bank gold holders, the Bundesbank has probably generated the most interest and attention over the past few years due to its substantial and long drawn out repatriation of a large amount of its gold from storage sites in New York and Paris to storage at its own headquarters in Frankfurt, Germany. In 2012, it became public knowledge that the German Federal Court of Auditors, the Bundesrechnungshof, was critical of the Bundesbank’s oversight of storage arrangements for that portion of German gold reserves which were stored abroad at the vaults of the Federal Reserve Bank of New York, the Bank of England and the Banque de France. The German Federal Court of Auditors (FCA) is an independent judicial institution whose powers derive from the German Constitution, and which is responsible for financial management of the German State. In its 2011 confidential audit of the Bundesbank, the Bundesrechnungshof specifically took exception to the lax way in which the Bundesbank merely relied on annual written statements from its foreign gold custodians about Germany’s gold holdings. The Bundesrechnungshof was also critical that the Bundesbank did not conduct any physical audits of its gold stored abroad.This confidential audit report was first passed to the finance committee of Germany’s parliament, the Bundesstag, and following this, a redacted version of the report became public in October 2012. In a report, dated 22 October 2012, the same date on which the Bundesbank released the above statement, German newspaper Der Spiegel reported that the Bundesbank had agreed to transport 50 tonnes of gold from the Federal Reserve Bank New York each year for 3 years, in order for this gold to “undergo a detailed examination” . The Federal Court of Auditors report therefore appears to have been the triggering event for the initial (and subsequently altered) gold repatriation program that was first promised by the Bundesbank in October 2012 (Plan A). Arguably, the gold repatriation program was put in place in reaction to the criticism from the Court of Auditors purely so as to appease a number of parties including the Court of Auditors and German lawmakers, the German public, the German financial media and a number of German citizen groups that had already at that time been lobbying for repatriation of Germany’s gold reserves. As of the end of December 2011, the Bundesbank claims to have held 3396 tonnes of gold stored over 4 storage locations as follows: 1036 tonnes at the Bundesbank in Frankfurt (31%), 1536 tonnes at the FRBNY in New York (45%), 374 tonnes at the Banque de France in Paris (11%), and 450 tonnes at the Bank of England in London(13%). As of the end of 2012, the Bundesbank claims to have held 3391 tonnes of gold, stored in the same 4 locations and in the same percentage distribution as in 2011. The reduction of 5 tonnes in Bundesbank gold holdings between 2011 and 2012 was due to the Bundesbank supplying gold for use in the German Ministry of Finance’s gold coin program (see below). In January 2013, the Bundesbank announced a ‘new’ gold repatriation plan (Plan B), different to the plan it had announced in October 2012 that had called for the transfer of 150 tonnes of gold from the FRB over 2013 – 2015. The ‘new’ plan intended to transfer gold from New York and Paris so that by 2020, the Bundesbank would be storing 50% of its gold holdings in Frankfurt, 37% in New York, an unchanged 13% in London, and 0% (zero) in Paris. In tonnage terms, the plan required the transfer of 300 tonnes of gold from New York to Frankfurt and the transfer of 374 tonnes of gold from Paris to Frankfurt by 2020. In January 2014, the Bundesbank reported on the first full year of its gold repatriation project. Surprisingly, during the entire calendar year of 2013, the Bundesbank only succeeded in transporting back a paltry 5 tonnes of gold from New York, and 37 tonnes of gold from Paris. The 5 tonnes of gold transported from New York was not even Good Delivery gold, and had to be melted down and recast into new bars, suggesting that the New York Fed had given the Bundesbank low-grade coin bar gold of dubious purity. The inability of the Bundesbank to repatriate 50 tonnes of gold from New York during calendar year 2013 retrospectively looks to have been the reason why it scrapped Plan A, and issued a new plan (Plan B) calling for 300 tonnes of gold to be transferred from New York by 2020. In January 2015, the Bundesbank reported that it had managed to transfer 85 tonnes of gold from New York and 35 tonnes of gold from Paris, i.e. 120 tonnes overall. Notably, of the 85 tonnes transferred from New York, the Bundesbank had to melt down and recast 50 tonnes of this gold, again suggesting that whatever gold the New York Fed had given the Bundesbank was not Good Delivery gold but merely low-grade coin bars or similar, or perhaps that the two central banks wanted to obscure the provenance of the metal. In January 2016, the Bundesbank announced a progress update of its gold repatriation program during 2015. During calendar 2015, approximately 100 tonnes were repatriated from New York and 110 tonnes from Paris. As of the end of December 2015, the Bundesbank’s gold storage distribution was claimed to be as follows: 1,402 tonnes in Frankfurt (41.5 %), 1,347 tonnes in New York (39.9%), 435 tonnes in London (12.9%), and 196 tonnes in Paris (5.8%). In total, from 2013 until the end of 2015, the Bundesbank transferred 366.3 tonnes of gold from New York and Paris to Frankfurt, leaving 307.4 tonnes to transfer between 2016 and 2019. On 9 January 2017, the Bundesbank provided an update on its gold repatriation program and the geographical distribution of its gold storage arrangements, claiming to have transferred 111 tonnes of gold from New York to Frankfurt and 116 tonnes of gold from Paris to Frankfurt during 2016. According to the Bundesbank, this left 91 tonnes of gold still to be transferred from Paris to New York (to complete a 374 tonne transfer from Paris), a transfer which the Bank claimed would be completed during 2017. The Bundesbank also had the audacity to claim in January 2017 that since it’s planned transfer of 300 tonnes of gold from New York to Frankfurt was now complete, and that the planned transfer of remaining gold from Paris to Frankfurt would be completed during 2017, that it was therefore well ahead of its ridiculously long 7 year timeframe which it had initially set in 2013 for transferring 300 tonnes of gold from New York, and 374 tonnes of gold from Paris, combined transfers which could easily have been executed over only a matter of weeks during 2013 if there was a will to do so. In all of its annual updates about its gold repatriation program, not once did the Bundesbank ever publish any details of the gold bars that it transferred nor anything resembling a gold bar weight list. In October 2015, the Bundesbank did publish a very incomplete list of its gold bar holdings, however this list omitted crucial industry standard details of the bar holdings, specifically the list omitted refiner brand, bar serial number, and year of manufacture of each bar. For London Good Delivery (LGD) gold bars, which the Bundesbank claims to hold, these attributes of refiner brand, serial number and year of manufacture are normal variables in industry standard gold bar weight lists. Any attempts to enquire about these incomplete weight lists are met with deflection by the Bundesbank . The Federal Court of Auditors’ confidential report on the Bundesbank’s gold which became public in October 2012 contained one previously strange and unknown claim, which was that between the years 2000 and 2001 the Bundesbank had completed the secret transportation by air of 940 tonnes of its gold from the Bank of England vaults in London to the Bundesbank headquarters in Frankfurt. Prior to this secret repatriation, the Bundesbank claimed to hold 1,440 tonnes of gold in London, therefore following the transfer, the German holdings at the Bank of England only totalled 500 tonnes. As to why this secret repatriation of 940 tonnes of gold was undertaken and why the details had never been made public prior previously is unclear. The Bundesbank regularly sells small quantities of gold (amounting to a few tonnes) to the German Federal Ministry of Finance to supply gold for the finance ministry’s gold coin minting programme. Apart from these transactions, the Bundesbank stats that it doesn’t buy or sell any gold. Therefore, in its annual report, it is quite common to see the Bundesbank’s gold holdings drop my small amounts from year to year. For example, between December 2014 and December 2015, the Bundesbank’s gold holdings dropped by 3219 kilos, which was explained as “the sale of gold to the Federal Government at market prices for the purpose of minting gold coins”. Again, the disdain with which the Bundesbank treats enquires about its gold policies and activities highlights its total non-accountability to the public and its lack of transparency. In October 2012, prior to the beginning of its gold repatriation program, the Bundesbank revealed that the gold that it already held in Frankfurt was stored as follows: 6,000 bars (75 tonnes) stored on industrial strength shelves, and a further 76,000 bars (945 tonnes) stored in sealed metal containers which are housed within 4 “safe boxes” (strong rooms). 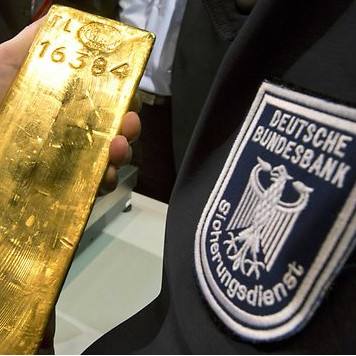 The quantity of 76,000 Bars (945 tonnes) held in sealed metal containers is very similar to the quantity of 940 tonnes that the Bundesbank claimed they brought back from London to Frankfurt in 2000-2001, so it appears that the gold that is in these sealed containers is the same gold that was previously held in London. The metal containers and the rooms in which the containers are stored can be seen in 2 videos which are accessible on the Bundesbank website.